Welcome to Forestry & Grounds Division. Forestry Division maintains and cares for all trees within the limits of Town property lines including all street trees, park and recreation trees, all trees around public buildings, all trees on public school property and all trees within the limits of the Town forest and watershed areas. Grounds Division maintains and improves 150 acres of grounds at 65 locations including general cleanup, trash removal, lawn mowing, technical turf care, pest control, fence maintenance, equipment and facility maintenance, general landscaping and playground safety and control. 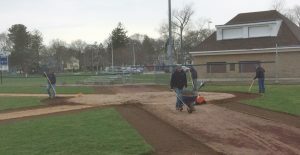 Grounds Division also maintains and improves athletic fields, including 3 official baseball fields, 10 little league fields, 9 softball fields, 12 acres of soccer fields and the Danvers High School Athletic Complex. The Grounds Division works with the Recreation Department to improve and maintain playground facilities, basketball and tennis courts, Sandy beach, Pope's landing and the Endicott Estate.